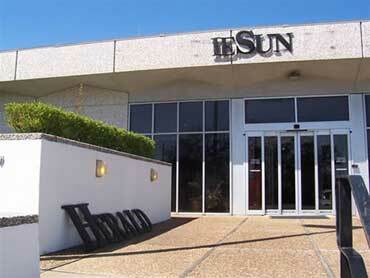 "The Sun" never went down at the Sun Herald building. By now, Hurricane Katrina seems like old news. Memories start to fade and the visions of disaster and destruction morph into new scenes like the shifting images on a computer screen saver. Unless you are still there. The recovery from one of the worst natural disasters to hit the United States will be measured in years, not months. Katrina struck the Gulf Coast on Aug. 29, leaving behind death and destruction. The storm’s scope far exceeded anything anyone could have imagined. In the Gulf Coats alone, 100,000 homes were damaged and 68,729 completely destroyed. Three hundred people lost their lives and another 200 are still missing. A collection of RVs and tents along the back of the Sun Herald's parking lot, dubbed "Camp Hope," served as emergency housing for employees and those who first arrived to help. Publisher Mathews rode out the storm at his home just across a bridge from the newspaper building. The bridge was destroyed and Mathews now crosses the bay each morning in a 16-foot skiff. “It’s really a very cool commute,” he said. Sportswriter Don Hammack was not as lucky. This paragraph from an article written by Patrick May of the San Jose Mercury News tells the story. 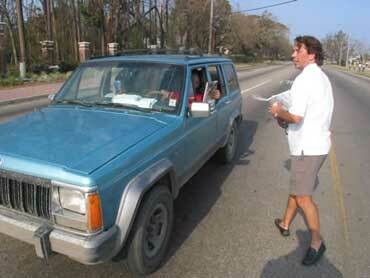 Don Hammack, 38, a sportswriter and ‘Eyes on Katrina’ blogger, thinks he lost his house. He got a half-block away, saw part of his roof and his Drive By Truckers CD on the ground and realized he wasn’t ready to see any more. … At a staff meeting he asked if he could use the paper’s address temporarily for his mail, then broke down. Sun Herald columnist Jean Prescott’s sister and brother-in-law died in the storm. Katrina milestones were noted in Updates e-mailed to all Knight Ridder employees and posted on the company’s Web site. Aug 31: There is some concern that the newspaper office is an oasis in the midst of a devastated area; people are beginning to come by asking about water and food. Security is increased. 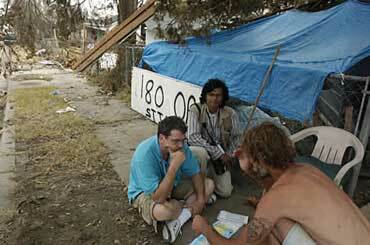 Charlotte Observer reporter Mark Washburn, left, and (Macon) Telegraph photographer Nick Oza interview a Gulfport resident. Sept. 2: A photo gallery on the newspaper’s Web site attracts six times the traffic of Dave Barry’s blog on his best day. The portable toilets arrived. Sept. 4: The critical concern now is infectious disease. A physician and nurse arrived yesterday. At their advice, wash stations were set up at the entrances to the building, near the portable toilets and other places. Photographers and reporters who return each day covered with mud must remove their shoes and soiled clothing before going inside. A disinfectant tent has been set up; a shoe wash is being devised. 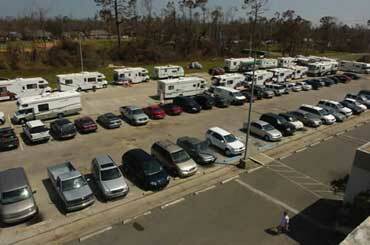 Many of the carriers appear to be living in their cars, with their families and pets. The Sun Herald is giving them daily family packs of water, food and non-perishables. Sept. 6: The newspaper’s doors open for business for the first time since the storm. Sept. 7: Last missing employee is found safe. Sept 12: Paper is edited and produced entirely in Biloxi for first time since Katrina hit. Oct. 10: The newspaper begins charging for home delivery again. Sun Herald Circulation Sales and Marketing Manager Dan Hunter hands out newspapers to people in the hurricane-devastated community. Nov. 11: Signs of a recovery are heartening. Average daily single copy sales surpassed 10,000 in the first week of the month, a new record. In advertising, post-storm business remains brisk. Major retailers are slowly reopening and returning to the paper. More than 70 percent of pre-Katrina local advertisers are up and running – and advertising. Slowly Sun Herald staffers are rebuilding their lives. The first grant checks were delivered to about 150 employees from The Knight Ridder Inc. Fund, compiled primarily from donations by colleagues throughout the company. In addition, boxes and pallets of cool-weather clothing and other items have arrived at the Sun Herald, also from around Knight Ridder. “I‘ve had so many people come by my office in tears to say thank you,” said Human Resources Manager Wanda Howell. “I want to send a big fat Thank You to everyone who left the comfort of their jobs and homes to come to a place that was in the worst of conditions. You had to sleep on the floor, eat MREs and go to places that were hazardous. You gave us your shoulders to cry on and let us share our terrible experiences with you. You did all this for us with a smile on your face. You were just what we needed,” wrote Karen Shook. Kathleen Burton, inside sales representative, expressed hers in this note: “Thank you to all who came down to Biloxi to help and to all that sent items. You never will know how much it meant to come to the office and get a hot meal for a child."